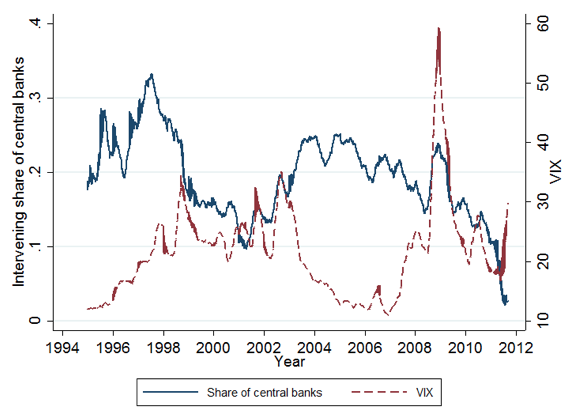 Central bank interventions in foreign exchange markets have long been viewed with scepticism by academics. This column examines foreign exchange interventions for a sample of 33 advanced and developing economies. Interventions occur frequently, in episodes that can last several days, and are often successful in smoothing exchange rates. These results show that central bankers, particularly in emerging markets, appreciate the efficacy of interventions. Should Brazil’s central bank be selling foreign reserves? The process of financial globalisation has dramatically increased international capital flows. This change has led policymakers to care more about the management of these capital flows. While in recent years attention has been mainly devoted to capital controls of various forms, foreign exchange (FX) interventions – as another tool for capital flow management – have been mostly neglected until recently (e.g. Blanchard et al. 2015, Ghosh et al. 2017). new theory identifies the case for interventions to enhance welfare (Gabaix and Maggiori 2015, Hassan et al. 2016, Cavallino 2017). We contribute to this field by compiling a new dataset of 33 countries, revealing stylised facts about interventions (Fratzscher et al. 2017). Our daily intervention data from 33 countries cover the period from 1995 to 2011. Most of these (sterilised) daily intervention data are provided by central banks on a confidential basis. This contrasts with earlier intervention data, which were either proxies (such as changes in reserves or press reports about interventions) or were limited to country case studies. Our data include 14 advanced economies and 19 emerging and developing economies. Thus the sample of countries is both broad and diverse in terms of several characteristics, such as income per capita, regional location, exchange rate system, and the developmental state of foreign exchange markets. We identify four stylised facts. FX interventions are used frequently – on 19% of all 113,800 observation days in our sample. As expected, this average masks enormous heterogeneity, with central banks in floating regimes intervening on 7% of days, contrasted by narrow band regimes where interventions occur on 34% of days. There are also differences over time, as Figure 1 shows. Intervention activity seems to be partially related to market uncertainty and global risk aversion, proxied by the VIX index. Source: Authors’ calculation. Values are smoothed using a centred three-month window. Foreign currency purchases dominate in the sample period, reflecting the desire of many emerging markets to build up reserves in order to shield their economy against adverse shocks. Another motivation may be the aim of protecting domestic exporters. On average, a central bank’s daily intervention volume equals about 0.02–0.05% of the intervening country’s GDP, with lower shares in floating regimes and higher ones in narrow band regimes. Across all countries in the sample, this amounts to almost $50 million per intervention day. In the euro area, assuming the same share of intervention to GDP, this would be nearly $2 billion dollars per intervention day. 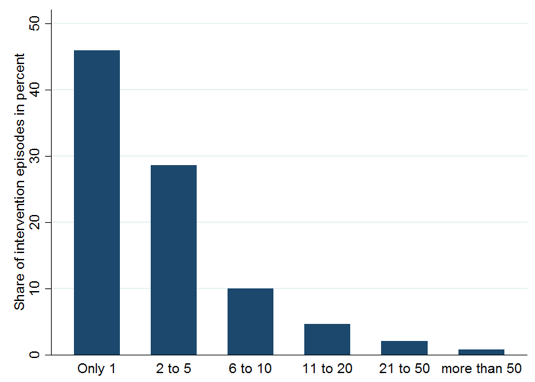 The amount during the first day of an intervention episode is systematically higher than on subsequent days. FX interventions occur in episodes and the average length is five days (see Figure 2). Our definition of episodes requires interventions to go only in one direction (either purchases or sales) and gaps between episodes of at most nine non-intervention days. If the intervention direction changes or there was no intervention for at least ten days, then the next intervention day marks the start of a new intervention episode. The documented frequency and intensity of FX interventions coincides with the belief of central bankers, as stated in a recent survey carried out at the Bank for International Settlements. The respondents evaluate about 70% of interventions as successful and another 20% as partially successful (Mohanty and Berger 2013). The ‘smoothing criterion’ – that during the intervention episode and up until five days later, the exchange rate change is still smaller than during the week before the intervention (which is useful when applied to all interventions against an earlier trend. We complement these criteria by also measuring a ‘stabilisation criterion’ – that during the intervention and two weeks after, the exchange remains within a 2% exchange rate band. This latter criterion is derived from those many exchange rate regimes which target a narrow band up to 2%. The event criterion is basically used to measure success in floating regimes, and requires that exchange rates follow the intervention direction – a rate of more than 50% indicates success. For other exchange rate regimes, exchange rate development paths and success criteria, a 50% benchmark is unlikely to hold. Therefore, we derive ‘placebo’ benchmarks for all three criteria from those periods by calculating success of placebo episodes that are assumed to take place on non-intervention days. The placebo benchmark for the event criterion in floating regimes is indeed 48%. The placebo benchmark for the stabilisation criterion in narrow band regimes, by contrast, is 77%. 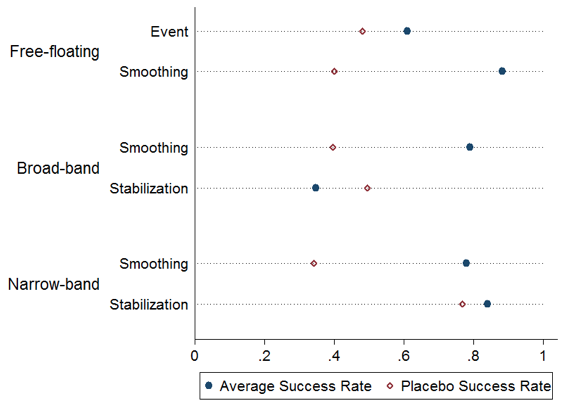 The other placebo benchmarks are shown in Figure 3 and are in between 34 and 50%. When we compare the unconditional success of FX intervention against these placebo benchmarks, we find that interventions often succeed. The event criterion in floating regimes is realised in 61% of cases and stabilisation in narrow bands in 84%. In all exchange rate regimes intervention seems to be very successful as measured by the smoothing criterion, which is the most common intervention objective mention by central bankers. The only exception is the stabilisation criterion applied to broad band regimes, and this result is not surprising due to the mismatch between target (close to 5%) and the measure (2%). We go beyond the unconditional estimates and also use a matching algorithm to account for intervention circumstances, because these may differ systematically between times of intervention and non-intervention. We furthermore study how such characteristics translate into success probabilities. We find that interventions are more likely to succeed if intervention volumes are larger, under all success criteria. We also find that oral interventions – that is, communications from central bankers to explain their rationale and make interventions public – matter. They are especially helpful for the event criterion, and thus in a world of floating regimes where interventions constitute a less frequent occurrence and need more explaining. Oral interventions also enhance effectiveness at times of turbulence in financial markets, when communication provides much needed guidance, irrespective of the exchange rate regime in operation. Central banks use sterilised intervention operations in the FX market – as a separate tool from monetary policy actions – for a variety of reasons, largely depending on their exchange rate regime. Using a unique dataset on central bank interventions across 33 countries, we show how interventions are implemented, and that they are effective in smoothing and stabilising exchange rates as well as affecting the level of the exchange rate. This is especially true when interventions are large in size and accompanied by appropriate communication during periods of turmoil in financial markets. In short, in contrast to the widely held scepticism of the effectiveness of this policy tool among academics, we find that central banks appear to master the art of intervention in currency markets rather well. Blanchard, O, G Adler and I Carvalho Filho (2015), “Can FX intervention stem exchange rate pressures from global capital flow shocks?”, NBER, Working Paper No 21427. Cavallino, P (2017), “Capital flows and foreign exchange intervention”, mineo, IMF. Fatum, R and M M Hutchison (2003), “Is sterilized FX intervention effective after all? An event study approach”, Economic Journal 113(487): 390–411. Fratzscher, M, O Gloede, L Menkhoff, L Sarno and T Stöhr (2017), “When is foreign exchange intervention effective? Evidence from 33 countries”, CEPR Working Paper No 12510 (forthcoming in American Economic Journal: Macroeconomics). Gabaix, X and M Maggiori (2015), “International liquidity and exchange rate dynamics”, Quarterly Journal of Economics 130(3): 1369–1420. Ghosh, A R, J D Ostry and M S Qureshi (2017), “Managing the tide: How do emerging markets respond to capital flows?”, IMF, Working Paper 17/69. Hassan, T A, T M Mertens and T Zhang (2016), “Currency manipulation”, NBER, Working Paper 22790. Mohanty, M S and B Berger (2013), “Central bank views on FX intervention”, Bank for International Settlements, Paper No 73: 55-74.